This animated graphic represents the start (8:40am BST) and end (8:57am BST) of Venus’ daylight occultation by the Moon on Wednesday, 6 April as seen from the centre of the British Isles. If you wish to observe this event, extreme caution is advised: the Moon lies just 16 degrees from the Sun. AN graphic by Ade Ashford. On the morning of Wednesday, 6 April everyone in the British Isles with a telescope and a clear sky living south of a line drawn between Galway in Ireland, Dumfries in Scotland and Berwick-upon-Tweed in Northumberland can potentially observe planet Venus slip behind the northern polar regions of the 28-day-old waning crescent Moon. 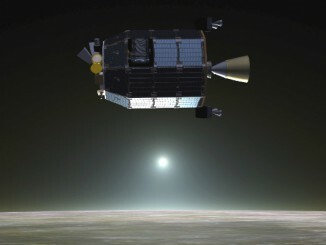 Before you all get too excited, however, there is a catch: this is an occultation that occurs in full daylight for the UK with the Moon and Venus low to the east-southeast horizon, the pair positioned just 16 degrees — less than the span of an outstretched hand at arm’s length — away from the Sun’s dazzling glare. I make no apologies for stressing that this is a challenging telescopic observation reserved for experienced observers. Casually sweeping the sky for the Moon and Venus with binoculars or a telescope after sunrise carries the very real danger of instant and irreparable eye damage if you accidentally view the Sun. Assuming, then, that you are aware of the risks and possess either a driven equatorially-mounted telescope with setting circles and an accurate polar alignment, or an instrument on a computerised GoTo mount accurately aligned in the predawn of 6 April, here is what you can expect to see. Please note that all times used in this article are British Summer Time (BST). Venus (α=00h 04.4m, δ=-01° 09′ J2000.0) has a magnitude of -3.9 on the morning in question. Its 96 percent illuminated disc subtends an angular size of just 10.2 arcseconds since the planet lies some 152 million miles (244 million kilometres) distant on the far size of the Sun as seen from Earth. This means that a telescope magnification of 200x is required to enlarge Venus’ gibbous disc to the same size as the adjacent Moon appears to the unaided eye — assuming one could see the wafer-thin, 2 percent crescent of such an old Moon so close to the Sun with the naked eye in daylight! In the extreme southwest of England, you will see Venus start to disappear behind the Moon at 8:25am and, if your telescope mount has an accurate drive system, you will see it start to reappear again at the unilluminated lunar hemisphere shortly after 8:53am. As seen from the centre of the British Isles, Venus begins its disappearing act at 8:40am when the planet lies just 19 degrees above the east-southeast horizon, only for Venus to creep back into view just before 8:57am. For London, be ready at the eyepiece by 8:31am with a 30-minute occultation in prospect. At the top of the page I made mention of the line extending from Galway in Ireland (8:42am), to Castle Douglas in Scotland (8:49am), through Dumfries (8:50am) on to Berwick-upon-Tweed in Northumberland (8:52am) that divides the country into those in the south that shall see Venus covered by the Moon and those in the north that will not (sorry, Glasgow, Edinburgh, Aberdeen, Inverness, et al., this time). While it is more common to talk of a geographical graze line from which to observe the point-like source of a star against the irregular edge of the Moon — appearing to flicker on and off as it is alternately visible in lunar polar valleys and hidden by adjacent peaks — Venus presents a discernible disc in the telescope. This means there will be a sizeable band centred on the graze line over which one may see just a portion of Venus’ disc covered by the Moon. Are you one of the lucky ones who might have seeing steady enough to witness the silhouette of lunar mountains gliding past the globe of Venus? 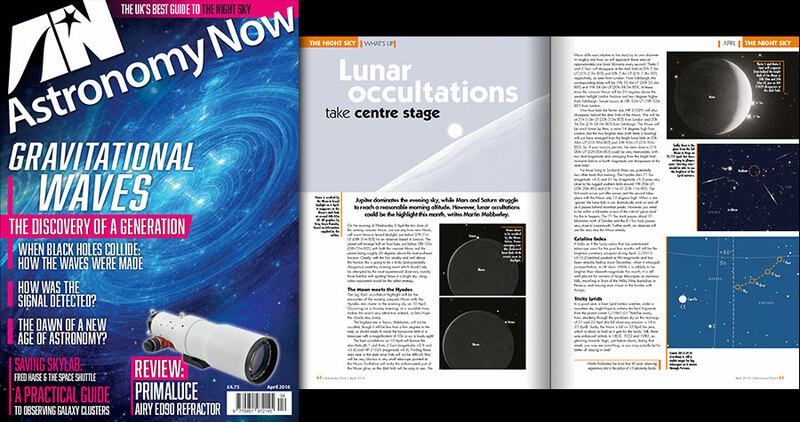 Find out all you need to know about observing the Moon and Venus in the April 2016 edition of Astronomy Now, the UK’s biggest monthly astronomy magazine. 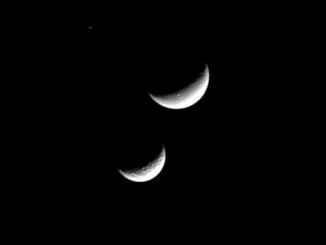 Dione and Tethys, two moons of Saturn, pose together for a mythological ‘mother and daughter’ portrait in this image from the Cassini mission.